It has been an exciting week for us! Our Kickstarter campaign has exceeded 50% of our goal and we still have 11 days to go. Thanks to everyone that has pledged to our project so far. We still need about $2,000 and remember, Kickstarter is all or nothing. If we don’t reach our $5,000 goal we don’t get anything. Keep sharing our link, Facebook page, website, and talk to everyone you meet about our project. Thanks for getting the word out! 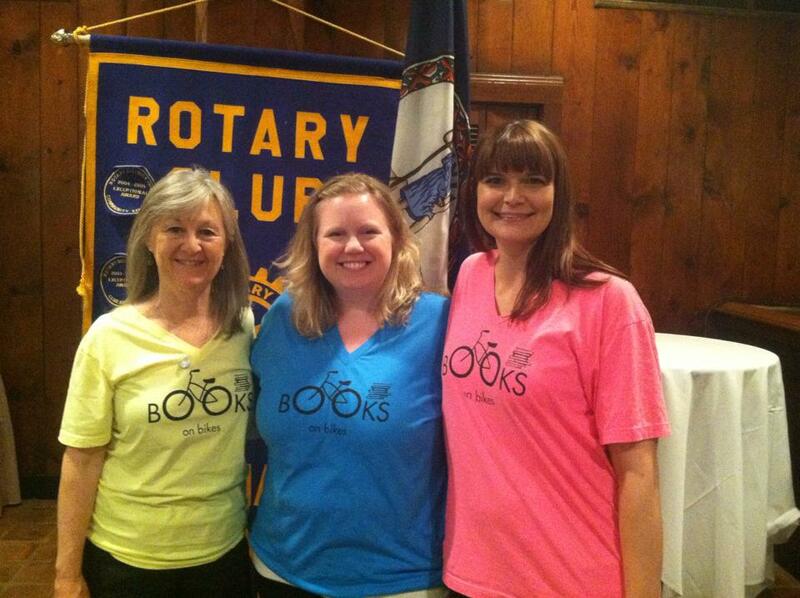 On Thursday, May 8, Books on Bikes was honored at the Albemarle Rotary Club’s Small Charities Award luncheon. We were presented with a $500 check for our program and had a delicious lunch at the Boar’s Head Inn. We met many wonderful people from the Rotary Club and so many amazing non-profit groups that were also being honored. Friday, May 9th was another exciting day for us. 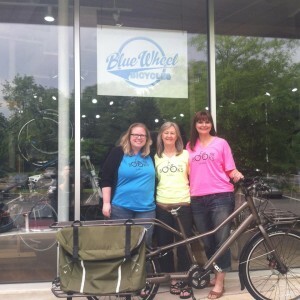 With our award from the Albemarle Rotary Club, we had enough money to put down a deposit on the 3 cargo bikes we are planning on purchasing from Blue Wheel Bicycles. The deposit gets the bikes out of the warehouse and to Blue Wheel, where they will be waiting for us. This, of course, depends on us achieving our Kickstarter goal. We are confident you guys can make that happen. We were also filmed for a news story by Newsplex CBS 19 on Friday afternoon. Kellie made a wonderful spokeperson and told the reporter all about our project. We were hopeful that the story would make it on the 6 o’clock news but there was a lot going on in Charlottesville yesterday. I think our happy story got nixed for some not so happy stories happening around town, but Kellie says our story made it on the 11 o’clock news. We are just about a month away from the end of school, which means the start of Books on Bikes! We are so excited (not just because school is ending). We can’t wait to visit our students in their neighborhoods and hand them books to keep them reading all summer. 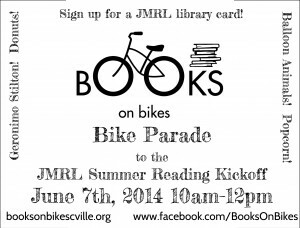 To kick off our program, we will be having a Bike Parade from Clark Elementary to the JMRL Central library for their Summer Reading Kickoff celebration. 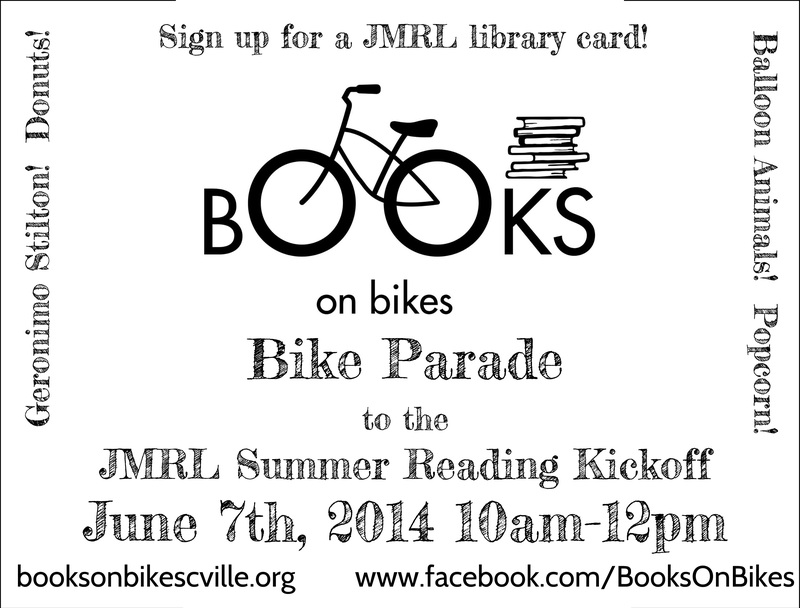 This is a free family event, we just want to celebrate summer and the beginning of our Books on Bikes summer. There will be many activities at JMRL for kids, treats, and the chance to sign up for a library card and the summer reading program. Geronimo Stilton, the famous mouse detective from the popular book series, will be there too! We will meet at Clark at 10am on Jun 7th. There will be a quick bike safety lesson and then we are going to decorate our bikes like parade floats. Ms. Flowers is already planning on covering hers in flowers like a Rose Bowl float. We will have decorations but bring your own too if you have a great idea. You don’t have to have a bike, you can walk along with us too! Children will need to be with a parent or adult. Once we get to the library you will be on your own to enjoy the celebration that lasts until noon. Thanks again for everyone who has supported our Kickstarter campaign. Tell your friends! We are hoping that those bikes that are waiting for us at Blue Wheel can be a part of our bike parade on June 7th. Monetary donations are also accepted at the Charlottesville City Schools Central Office or Walker Upper Elementary School. Checks can be made out to Walker School with Books on Bikes in the memo line. If you’d like to send a donation by mail you can send it to Rebecca Flowers at Walker Upper Elementary School, 1564 Dairy Rd., Charlottesville, VA 22903. We will also be at the Charlottesville City Market on Saturday mornings. This weekend we are spending time with our kids and moms, but we’ll be back next weekend!